My first interaction with an Amazon seller was when a client began negotiating to purchase a business that had an Amazon seller’s account associated with it. While I always represented entrepreneurs, I was spending the majority of my time in courtrooms trying cases for lawyers who did not know how to try case. After the client negotiated for several years, he ultimately purchased the Amazon based business and the Amazon seller’s account was suspended. At the time, I was not qualified to help that Amazon seller with his suspended account. But I was made aware that there was a need… That suspended Amazon seller needed somebody to turn to when they had issues with Amazon that required analysis, persuasive writing of plans of action to get suspended accounts reinstated, and also help with intellectual property rights issues. The timing of the call about the suspended Amazon account could not have been better. I had recently gone through a divorce and was wrapping up a very difficult custody battle. Like many Amazon sellers, I was ready to start a new chapter in my career. Amazon Sellers face many challenges. Amazon Seller’s accounts get suspended without notice and with recourse at the hands of the same company that put the seller out of business… usually temporarily. My law firm is the number one law firm or company that helps suspended Amazon Sellers get their accounts back and get their listings back. We are great at what we do for one reason: we have a fantastic team of college-educated people working together in our New York office. 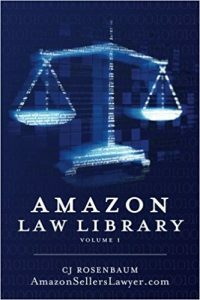 The team at Rosenbaum Famularo, P.C., the law firm behind AmazonSellersLawyer.com consists of over 30 people. I am blessed to call each and every one a colleague and a friend. My partner, Anthony Famularo, Esq., is one of the brightest and hardest working lawyers I have ever met. Our managing paralegal Kerry McDonald is incredibly bright and devoted to the cause of helping suspended Amazon Sellers get their accounts and listings back. Our practice can be broken up into three main areas all of which are focused on Amazon Sellers. Every time a suspended Amazon Seller contacts us, we provide the suspended Amazon Seller the opportunity to speak with us and explain what is going on with his or her suspended Amazon account. We never charge for an initial consultation. We don’t accept money from suspended Amazon Sellers unless we think we can get their accounts back and get their selling privileges reinstated. Every client that hires us receives a call from the college educated paralegal that is reviewing their file so that a better understanding of the suspended Amazon account can be obtained so that we can draft a Plan of Action for that particular suspended Amazon account. All of the writing and all of the analysis of suspended Amazon Sellers’ accounts is done in our Long Beach, New York office. None of the analysis or any of the writing is farmed out to anybody outside of our team in our office. Every single Plan of Action for a suspended Amazon Seller, every single appeal for a suspended Amazon Seller and every single Bezos Escalation is written by our team in Long Beach, New York. Our experience successfully helping suspended Amazon Sellers led me and my team to write the number one book about how Amazon Sellers can avoid having their accounts suspended and how Amazon Sellers can avoid losing their listings. 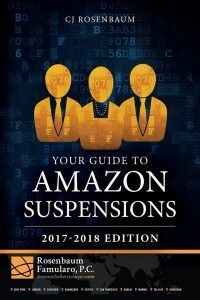 While “Your Guide to Amazon Suspensions” is available on Amazon.com, we pride ourselves in helping suspended Amazon Sellers help themselves. Under this theory, we are happy to provide free copies of our book to domestic sellers. We are happy to pay it forward to suspended Amazon Sellers so that they can help themselves. Whether your Amazon seller’s account is suspended for an inauthentic allegation, use old is new, a high ODR, tracking issues or any other claim Amazon asserts against you, our team is available to review the issues with you and help you get your account in your listings back. The second major portion of our practice has to do with intellectual property issues. Many Amazon Sellers have their accounts suspended based upon fraudulent or baseless accusations of violating another person’s or another company’s intellectual property rights. These are often called rights owner complaints. If your Amazon seller’s account was suspended because some company claimed you are violating their trademark, copyright, patent or trade dress rights, contact us. The vast majority of rights owner complaints against Amazon Sellers are entirely baseless. We help suspended Amazon Sellers yet baseless rights owner complaints retracted every week. Even when the person or company that made the complaint refuses to withdraw the complaint, we can still help that suspended Amazon seller get their selling privileges back. Our intellectual property practice also helps Amazon Sellers who have created their own private label brand. We help private label sellers protect what they build. We help private label Amazon Sellers obtain trademark protection, copyright protection and trade dress protection. We have the ability to monitor private label sellers listings for hijackers and we have the ability to persuade hijackers to stop violating your intellectual property rights. For those sellers who refused to amicably refrain from violating your intellectual property rights, we have the ability to have those sellers removed. Our method of practice when we protect Amazon private label sellers focuses on amicable resolutions. We never rush to knock off a seller or hurt another business. We never rush into court. Our goal is to protect our clients interests and promote business. While Amazon has a robust system that includes the submission of plans of action, the submission of invoices and receipts, the ability to express to Amazon how to spend it Amazon seller will become a better Amazon seller… Sometimes Amazon refuses to reinstate accounts. Sometimes Amazon refuses to refund a suspended sellers money. Sometimes Amazon refuses to return a suspended sellers inventory. There are many other issues that arise when Amazon simply fails to treat third-party sellers fairly. When this occurs, we represent Amazon Sellers and arbitrations against Amazon. It is a David versus Goliath battle and I am honored that entrepreneurs all over the world trust us to represent their interests against Amazon. My prior experience as a trial lawyer helps me enormously during these arbitrations. While every plan of action and every document that is written for an Amazon seller comes from our team in New York, we have full-time staff around the world so that we are available to sellers wherever they reside. We have full-time staff in Europe, Shenzhen, China and Yiwu, China. This fall, September 2018, we are opening an office in Australia to help service the sellers who are located inside Australia and sellers located in the United States and elsewhere who are selling consumers in Australia. Wherever sellers are located and where ever markets are found, you will find help from our team. We are here to help sellers. Litigating cases against some of the largest corporations in the world including: McDonalds, Sears, Kentucky Fried Chicken, many insurance companies. In NYC, obtaining redress for his clients against the NYPD, the NYC Housing Department, the NYC Health and Hospitals Corp., and other behemoths. Representing clients in the internet, finance, health and entertainment industries. Holding executive and leadership roles in the NYS Bar Association and the National American Association for Justice. Teaching other lawyers how to try cases in New York, Chicago, Montreal, Maryland, Florida and Los Angeles. If your Amazon selling account has been suspended, you’ve lost a listing, been accused of violating someone’s intellectual property rights, or you are developing your own private label brand, please contact me. Finally, a suspended Amazon seller can look at hundreds and hundreds of five-star reviews that me and my team has received from suspended Amazon Sellers all over the world that we have helped regain their selling privileges. My colleagues who also help Amazon sellers have invited me to teach sellers how to avoid suspensions, how to write their own plans of action, how to avoid intellectual property right issues and how to build their own brands. I have addressed incredible sellers all over the world… In excess of 20,000 sellers over the past few years. Domestically, I have spoken at the Prosper Show, Midwest Ecom, Retail Global, SCOE, ASD and other events for sellers. Internationally, I regularly speak at the global sources events in Hong Kong, events across China sponsored by Payoneer and numerous events in Yiwu and Shenzhen. Your information is safe when you contact us. When an Amazon seller calls us to help with a suspended seller’s account, to defend them against intellectual property right allegations or any other issues every seller who contacts us is entitled and receives the safety of the Attorney-Client Privilege. Amazon sellers do not have to worry that we will use information about their products, their listings or any other information they provide against them or to compete with them. Nobody who works at our law firm is permitted to become an Amazon seller. In the years that have passed, I have authored and co-authored multiple books and thousands of pages of content pacifically for Amazon sellers. 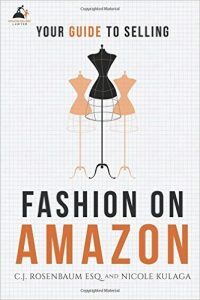 I am proud to be an author of Your Guide to Amazon Suspensions, Your Guide to Selling Fashion on Amazon and the Amazon Law Library. Seller’s Guide to Chinese Intellectual Property Law. 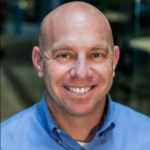 I am further honored to have been quoted in numerous articles including Forbes magazine, CNBC, FOXBusiness news, the Wall Street Journal, Bloomberg.com, the Huffington Post, the international business Times, the Denver Post, the Seattle Times and others.